"RAP4 is proud to offer you great deals for a great adventure: free rental of a T68 Gen7 magazine-fed marker with three magazines at Operation: End War this October 1st-2nd at TAG Paintball in Hollister, CA! 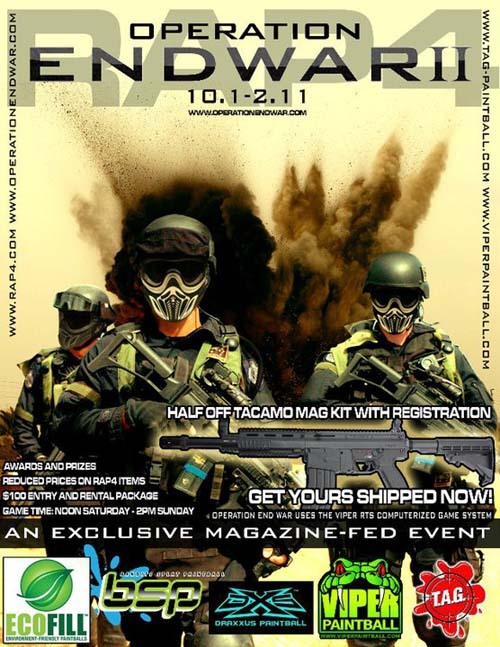 If you still haven't tried magazine-fed paintball, this is your opportunity to see what it's all about as you play among hundreds of other players exclusively using mag-fed markers. Discover how ditching that hopper opens up your field of vision; how switching to detachable magazines enhances the aesthetics of your mil-sim setup and adds a whole new dimension to your game; how playing with realistic amounts of paint per magazine changes the whole way you think about shooting and moving. Discover how mag-fed paintball is revolutionizing mil-sim games...and have that adventure for free with RAP4's awesome free rental package! All players with paid entry will qualify for free rental of a T68 Gen7 and three magazines, to use both days of Operation: End War 2. If you already have a mag-fed marker...bring it! And for those who know what this revolution in tactical gaming is all about, here are two great deals to get you into this great adventure: 50% off a Tacamo mag-fed body kit for your Tippmann, US Army, or other tactical marker, and 50% off of an Operation: End War 2 Tactical Package of T68 Gen7 and magazines...with paid entry to the event. With Viper Paintball running the scenario according to their proprietary game scoring system and tactical format, Operation: End War 2 is going to be a blockbuster event. Host field TAG Paintball is opening up their very best fields to accommodate the teams, and RAP4 will be on hand with your rental package, new body conversion kit or tactical package. Pre-register now for this unparalleled adventure in tactical gaming! Register for 2011 End War: http://operationendwar.com/game-registration"
Free rental of a T68 and the chance at a half off conversion kit? Not bad. Don't forget that the result of last years game were some excellently priced T68s that Mike previously reviewed, so let's keep our ears peeled for a similar deal this year!